Opened in April by the Governor-General Quentin Bryce, the new ABC Headquarters is a fitting addition to Brisbane’s Southbank. Designed by Richard Kirk Architects, and constructed by Leighton Contractors, the new headquarters has a 15,435sqm gross floor area, and stands four stories tall above ground, with a basement. The building has achieved a five star rating under the Green Star system. It presently hosts approximately 450 ABC staff, as well as members of the Queensland Symphony Orchestra. The previous ABC headquarters was closed in December 2006 after a widely publicised (and still unexplained) breast cancer cluster. 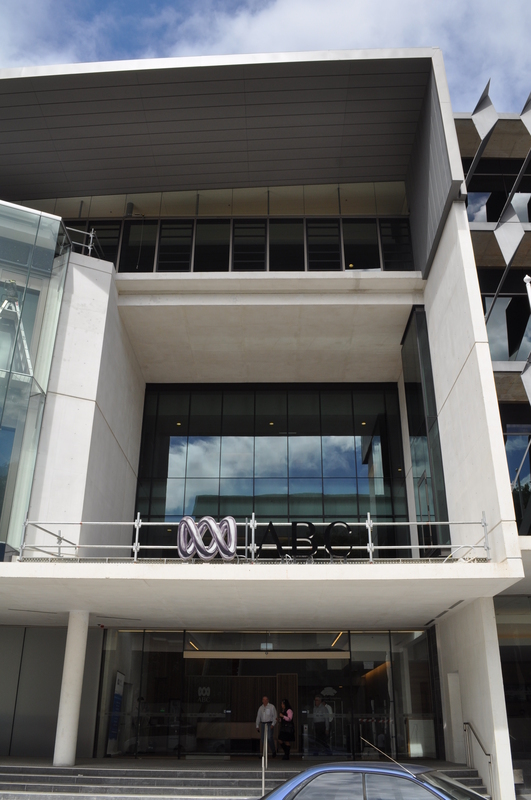 ABC staff spent the next several years working from a number of locations in Brisbane, the construction of this new facility re-unites them at a single location once again. Construction of the building wasn’t all smooth sailing – work was interrupted when the site was flooded in the floods of January 2011. G.James was contracted to supply and install the Window wall, shop front and studio glazing and sun shades on the west face of the building. Most of glazing uses IGUs with Super Neutral 365 & Crystal Grey glass panels, to provide a clear view to the outside. The window wall was quite deeply recessed into the building in order to reduce the amount of direct sunlight entering. Internal blinds as well as the prominent external sunshade are also used to contol the large amount of light allowed to enter the building. The studio at Northeast corner of the building features a frameless glass outer skin, using 12.38mm Optilight clear laminated glass, and suspended with steel bracket. There is an air way at the top and bottom for accoustic & thermal control. To satisfy acoustic requirements for the radio studio, all internal window wall frames were stuffed with insulation. The installation of studio outer skin was a particular challenge – the glass is held on just by the tip of the steel bracket and glass fin. 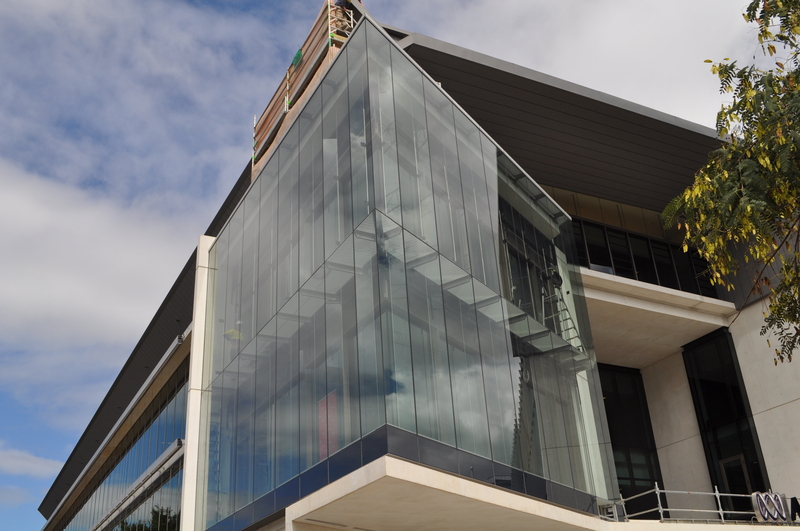 The glass wall above the main building entrance is another interestingly glazed feature. The wall was constructed using 50 mm x 200 mm aluminium box section with another T section bracketed to the concrete slab as framework. The IGUs used for this feature were site glazed. This entry was posted in Facades, Glass and tagged Frameless Assembly, Window Walls. Bookmark the permalink.